Ok...again I've presented a photo that's not really up to much. Benson Hall is hidden by a small hill on its Eastern side and a host of farm buildings on its West side. The only view that can really be had of this curious building, is from the North...shown below...and all we get here is one gable end. The building we see today consists of a mish mash of 16th, 18th and 19th century extensions and alterations. Benson Hall reputedly still retains the remains of an earlier building, ie, a pele tower.....a newel stair connects the ground floor and first floor, and there is a vaulted chamber on the ground floor. One of the internal walls, thicker than the 19th century walls around it, still has an entrance way through it with the remains of draw bar slots in it, possibly indicating an original entrance into the hall or tower. There is in fact very little information regarding this building, most of the info here coming from the listed building text that is available on line. As I find more information regarding this building, I'll post it here. 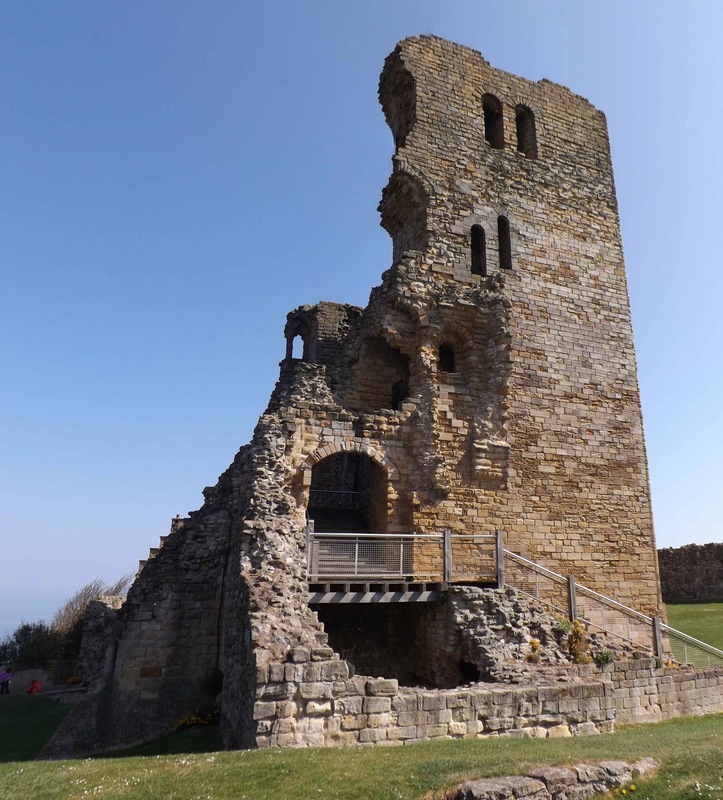 The keep, stood on its motte and surrounded by its bailey, represent the core of Scarborough castle. The wall and ditch were built in the 12th century by Henry II and were designed to create a secure enclosure within the confines of the fortified summit of the headland. Above. A view of the keep over the Eastern wall and ditch. The circumference of the bailey area measures approximately 250 meters. The keep was probably an addition to an already busy area, populated with both stone and wooden buildings. Above. The keep above the Eastern ditch. There were two gates into the inner bailey area of the castle. Both can still be seen to some extent. The first lies at the North end of the bailey near to the Master Gunner's house, and the other lies at the South end abutting the wall. Above. The keep viewed from within the bailey. The well in the centre of the bailey is quite impressive. It is around 46 metres deep, and is stone clad to an overall depth of around 20 metres. Above. View of the bailey, with the Keep to the right. Any buildings within the bailey were most likely demolished by King John in the 13th century, leaving the castle's Keep standing almost alone. The barbican, gatehouse and associated walls, provide Scarborough Castle with 230 metres of first line defences. The formidable stone built walls, towers and bridges (with wooden drawbridges originally) lie at the Eastern end of the castle, spanning the narrow ridge that allows access to the plateau on which the castle is built. Above. 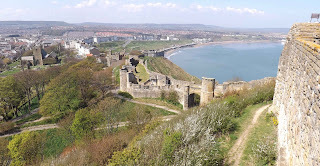 Panoramic view of Scarborough from the West walls. Unfortunately, as at many major ruined castles, the gatehouse has long since been demolished, no doubt of symbol of the removal of any authority the castle may have had over its local environs. The photo below shows the only remaining portion of stone work associated with this once great structure. Above. View of the remains of part of the Gatehouse. The gatehouse was directly connected to the curtain walls, and would have provided a second line of defence against any attack on the castle. Above. The Gatehouse and Barbican from the West walls. The view in the photo above, shows the extremely narrow entry way into the castle that the the barbican and its associated bridges would have allowed into the castle. Adding in the existence of draw bridges across the barbican's bridges, and this restricted entry way becomes an easily defended point of access. Above. Remains of one of the Barbican's towers. The Barbican and Gatehouse were important elements of the external defences of Scarborough Castle, which is possibly one reason that the gatehouse has been all but demolished, leaving us with a single mass of masonry standing to your right as you enter the castle. Above. Looking along the wall towards the Keep. Above. One of King John's curtain wall towers. Above. Looking along the wall towards the earth banks and the inner bailey. Above. Interior view of one of King John's curtain wall towers. Above. Detail of King John's curtain wall and tower. Above. Looking South East along the outside of the curtain wall. Above. Looking along the outside of the curtain wall towards North Bay. Above. The same part of the curtain wall, this time from the inner bailey area. Above. The Southern most end of King John's curtain wall, with the postern gate just visible. Above. Portion of King John's curtain wall with Civil war breach. Above. The curtain wall from within the inner bailey area. Above. The curtain wall from within the inner bailey, looking South. Above. Panoramic view of the curtain wall from the town below. Above. Interior view of one of the curtain wall towers. 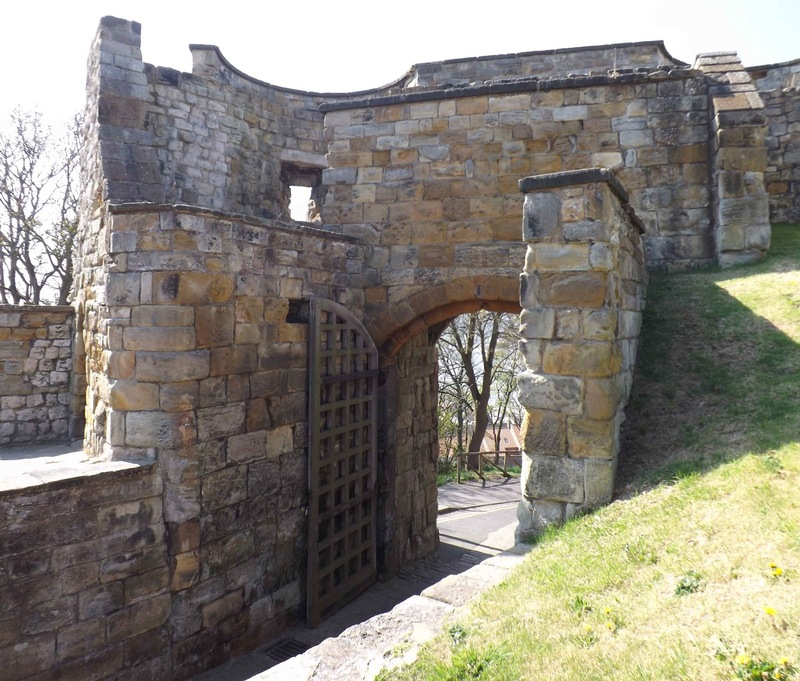 Situated at the far Southern end of the castle enclosure, the sally port, or West wall postern, offered safe access from within the confines of the castle's outer court to the South Steel Battery. The Battery was originally built in 1643 to provide clear line of site for a set of guns to cover the town's harbour. The postern was broken through the wall at this point, and designed to give gunners safe access to the gun platforms here. This is basically a covered staircase set with gun loops. Typically I didn't realise the importance of this structure when I visited this year, so didn't go down into the covered walk way within the wall to take more photos. This is one of two posters set within the West walls, the second sited a short distance to the North and set between two towers for protection. Above. The Keep from the South West. Above. The Keep's Eastern face, with the Master Gunner's House in the background. Above. Closer view of the Eastern face of the Keep. Above. Eastern face of the Keep, showing the plinth upon which the walls are built. Above. Close up of the sloping plinth upon which the Keep is built. Above. Interior of the Keep. Above. Vaulted room in the Keep. Above. View of the ground floor level of the Keep from the modern viewing platform. Above. The Keep from within the bailey area. Above. View of the Keep showing the extent of the Civil War damage. Above. View of the Keep from within the inner bailey area. Above. View of the Keep from the North, showing the Eastern earthworks and bailey wall. Above. Close up view of the Keep's plinth. Situated to the East of Scarborough Castle, high above Marine Drive and looking out over the North Sea, the Roman signal station makes for an interesting addition to the Norman and Medieval remains of the castle. Above. View of the outer earthwork banks and ditches. Up until the 1920s, the signal station was hidden from view, buried beneath the turf of the huge Eastern part of Scarborough Castle's environs. It sits on the cliff edge, missing a few feet of it's Eastern edge due to sea erosion, but on the whole is remarkably well preserved and presented. Above. View of the signal station with the castle in the background. The remains, dating from between 360 and 380 BC, consist of an outer bank and ditch, an enclosure wall and a central tower, now obviously long gone, which would most likely have housed a beacon of some sort. The centre of the remains are littered with masonry footings of medieval buildings, built on top of the Roman remains. One of these features, is the Chapel of Our Lady, probably built sometime around 1000AD. Above. Looking back towards the cliff edge and the signal station. The signal station here at Scarborough is known to have been one in a long line of Roman stations stretching along the East coast. This building would have represented a much later addition to the militarisation of Roman Britain, with its corner towers, large earth banks and deep ditches, and would have a been a very defensible structure.